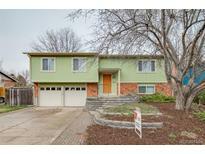 Below you can view all the homes for sale in the Ralston Valley subdivision located in Arvada Colorado. Listings in Ralston Valley are updated daily from data we receive from the Denver multiple listing service. To learn more about any of these homes or to receive custom notifications when a new property is listed for sale in Ralston Valley, give us a call at 720-580-6756. Great location that is walking distance to Meadow Lake Park and Wyndam Park MLS#9121155. Redfin Corporation. 3 bedrooms could easily become 4 in the area adjacent the garden level family room. Quick close and move-in ready! MLS#9577319. HomeSmart Cherry Creek Properties. This is a great, quiet location, that has lots and lots to offer. Buyer to verify schools MLS#6472138. RE/MAX 100 INC..
New furnace, two year old roof, new hot water tank, and a new central air conditioning unit. MLS#9462928. Realty One Group Premier Colorado. Solar hot water, added attic insulation 50R+, attic fan, Separate electrical panels for garage/basement/house, RV parking full length of the house 30 ft, Replaced Windows for better insulation. MLS#7672483. Colorado Flat Fee Realty Inc. The sellers can accommodate a quick closing if desired. Professional photos coming Monday! MLS#6563625. EXIT Realty Denver Tech Center. Easy commuting from here, get to the city or mountains in a snap! MLS#2408035. RE/MAX PROFESSIONALS.